Chelsea Place Celebrates Caregivers’ Rich Culture, Food and Coffee! Chelsea Place Memory Care in Aurora, Colorado, has the good fortune to have among their staff, several caregivers of Ethiopian decent. These marvelous women take great pride in caring for residents and can usually be seen smiling and working quietly to assist residents with their daily activities. Recently, however, these women took center stage in a celebration of their rich culture, including costumes, music, delicious food and aromatic Ethiopian coffee. The event was a resounding success, drawing many of the families of residents and staff, all eager to experience the ceremony and enjoy the taste of authentic African cuisine and beverages. What made the event even more special was that it gave all the participants the ability to celebrate a culture that many will never experience firsthand. “I am so happy, first of all, to present my country’s ceremony, showing respect for the people at Chelsea Place, and in turn their respect for us,” said Tegest Semegn, one of the caregivers who facilitated the ceremony. The ceremony opened with the roasting of green coffee beans and presentation of the roasted beans with their rich aroma to the assembled guests. Then the beans were slowly ground, steeping them in a pot, adding ice water and bringing them to a boil. While the coffee was brewing, Tegest Semegn, Beza Gebretsadik, Rachel Walube and others shared personal memories and traditions of the Ethiopian culture, even including a short lesson in Amharic, the language of Ethiopia. While they listened, the audience also enjoyed snacking on ceremonial food, including fresh popcorn, samosas and berbere bread. 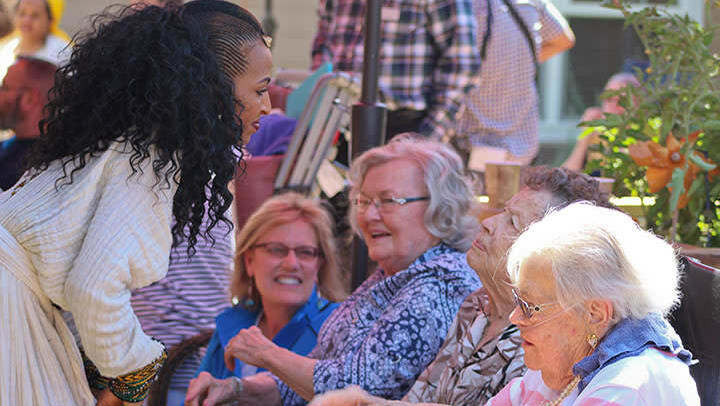 The event was enjoyed, not only by the residents and their families, but by the caregivers themselves. “It makes me so happy to see residents drink our coffee and eat our food” said Beza Gebretsadik, as she watched the staff and residents sip coffee from beautiful Ethiopian china cups. At Anthem Memory Care communities, we believe in providing care and compassion for residents as well as our dedicated, talented caregivers. We celebrate the unique backgrounds of all who come through our doors, residents and caregivers alike, and will always look for ways to bring their history and talents to life. We believe it is moments like these that keep our communities vibrant and full of life.